Lemuel Fowler was a flexible musician, ranging in style from popular jazz to ‘low down’ blues. His recording of Blues Mixture in 1923 was the closest in style to barrelhouse at the time. Fowler is also one of the few artists to utilize all three methods of distribution available at the time: sound recording, piano rolls, and sheet music publication. At least one of his compositions, The Wicked Fives, appeared in all three formats. Sound recordings of music by African-American artists intended for an African-American market had just begun, with Mamie Smith’s recording of Perry Bradford’s Crazy Blues in 1920. Piano rolls and sheet music publications of ragtime and blues, so popular from 1900-1920, would die out for the most part during the 1920s, replaced by sound recordings. The Wicked Fives, published in 1923, is one of the few examples from this time of the arched bass pattern also found in The Rocks by George W. Thomas. Note also the similarity of the vocal line to the chorus of Thomas’s New Orleans Hop Scop Blues in that both are shouting out dance moves. For comparison, the chorus of The New Orleans Hop Scop Blues is “Glide, Slide, Dance, Prance, Hop, Scop, um, um”. Fowler appears to owe a great deal to George Thomas in this piece between the similarity of the chorus and the use of the bass line from The Rocks. 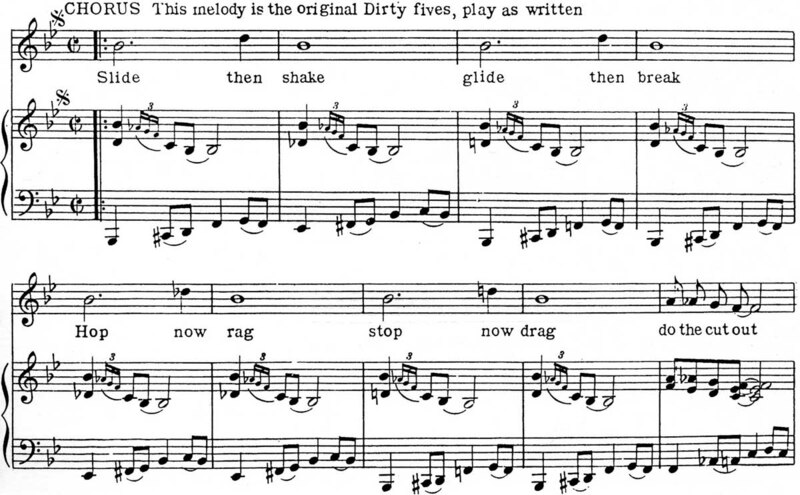 However, the sheet music of The Wicked Fives indicates of the chorus: “This melody is the original Dirty fives, play as written”. This suggests that there is a folk origin of the chorus, and perhaps the bass line, that potentially even predates the Hop Scop Blues. Also, both pieces are in the key of B-flat and both refer to a blues played down in Louisiana that people dance to. Fowler’s Blues Mixture, with its constantly changing figures and low-down style, may be the most barrelhouse-like recording of 1923, the first year of recorded piano solos. Blues Mixture shows Fowler as a much earthier player than his piano rolls would suggest. Note this breakout octave passage to the similarly loose feel in Will Ezell’s Barrel House Man and Skip James’s 22-20 Blues. Satisfied Blues, recorded at the same time, is subtitled a “Barrel House Blues”. It is not quite as barrelhouse as Blues Mixture but still very much so for its time. What is meant by a “Barrel House” Blues by Fowler? Certainly it comes from the practice of entertainment provided in a barrelhouse, but further, Fowler’s Satisfied Blues and Blues Mixture show evidence of the loose, low down style that was practiced there. Many of Lemuel Fowler’s sound recordings, including his piano solos, can be found on Lem Fowler 1923-1927. Sheet music by Fowler is included in Richard Riley’s Early Blues Folios #1 and #2, available on his website Pianomania.com. You can order the folios directly from him using the contact information on the site.